If you've read this blog for very long, you know I'm a promoter of modesty. I think modesty is not just an important trait to instill in our daughters, but to also reflect ourselves. God gave us, as women, the gift of softness, femininity and beauty. It’s our responsibility to convey those without conveying our sexuality. Allow your appearance to reflect your pure and virtuous heart. Know your worth and reflect it on the outside. Your body is a gift from God, honor it as such. I love this quote by Jessica Rey "Modesty isn’t about hiding ourselves, it’s about revealing our dignity". Our girls being exposed to Cosmo magazines in nearly every checkout line, this publication has steadily declined into a full-on pornographic ‘how to’ guide for teens and vulnerable young girls. Victoria's Secret now targets 18-24 year-olds with the PINK line. Nearly every popular clothing line has low rise jeans, crop tops and plunging necklines. The need for a clear voice on modesty has never been greater. In this book, teen and twenty-something young women are given actual pictures and examples of modern clothing. 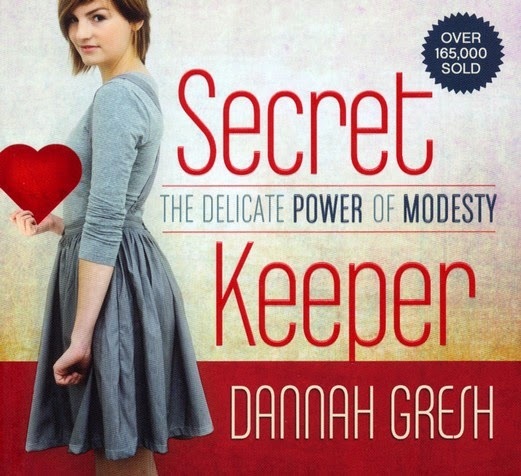 Dannah's approach to explaining the critical nature of modest is both cool and relevant. The photos will also show the girls how to take the 'Truth or Bare Fashion Tests.' In essence, this will provide concrete, 'how-to' modest dressing skills. Secret Keeper is a great mother and daughter book. I was given this book by Moody Publishers for the purpose of this review.